A true circus legend, Charlie Cairoli (1910-1980) was one of the greatest and most creative augustes of the second half of twentieth century, even though he had begun his brilliant career long before the Second World War. The son of an already famous clownGeneric term for all clowns and augustes. '''Specific:''' In Europe, the elegant, whiteface character who plays the role of the straight man to the Auguste in a clown team., Charlie, who was French (albeit of Italian descent and born in Italy), became after the war England’s most celebrated clownGeneric term for all clowns and augustes. '''Specific:''' In Europe, the elegant, whiteface character who plays the role of the straight man to the Auguste in a clown team.—and a British citizen. He worked for an unprecedented period of forty years, from 1939 through 1979, at Blackpool’s Tower Circus, of which he became the undisputed star and, without a doubt, the most popular attraction(Russian) A circus act that can occupy up to the entire second half of a circus performance.. He was born Hubert Jean Charles Cairoli on February 15, 1910 in Affori, a district of Milan in Italy, where his parents were appearing with their musical act. They micknamed him Carletto (and he was known as such for many years in the circus)—Carletto being the diminutive of Carlo, the Italian translation of Charles. His mother, Eugénie, was born Ricono, an old French circus family of Italian origins—like so many ancient circus families anywhere else in the world. As for Jean-Marie Cairoli (1879-1956), Carletto’s father, he was born in Moissac, in the southwest of France, on April 9, 1879. He had began his career as a juggler and foot juggler, and had turned into a musical "eccentric," with his wife as his partner. As a matter of fact, Jean-Marie Cairoli became a clown against his will and by accident. This was before World War I, and he was working for the old Cirque Pinder, then still under the management of Arthur Pinder; his contract required that he be "generally useful," a clause that was customary in the old circus (and theater) days, and really meant that an artist was expected to do whatever the management deemed necessary. Pinder was in need of a clownGeneric term for all clowns and augustes. '''Specific:''' In Europe, the elegant, whiteface character who plays the role of the straight man to the Auguste in a clown team., and Jean-Marie Cairoli was "volunteered" for the job; to soothe his reluctance, the management made a show of generosity in giving him the late Orlando Averino’s rich costumes, along with a partner. As it happened, Jean-Marie Cairoli showed a natural ability for the job, and he continued on that path with his wife as his augusteIn a classic European clown team, the comic, red-nosed character, as opposed to the elegant, whiteface Clown. ; they performed a clown adaptation of their musical act as Messina et Catastrophe. Before long, Jean-Marie developed a polished and elegant clown character, and he found more seasoned partners. He became a much admired and well respected clownGeneric term for all clowns and augustes. '''Specific:''' In Europe, the elegant, whiteface character who plays the role of the straight man to the Auguste in a clown team., and eventually created a clown trio that would be one of the few that could compete on equal terms with the greatest stars of the European clowning scene at the time, the Fratellinis. Tristan Rémy, the eminent French clown historian and chronicler, said of Jean-Marie Cairoli, "François Fratellini graced the ring with his impulsive kindness. Even though Cairoli didn’t have the same light in his face, the same whimsy in his eyes, he was the poet of the ring." 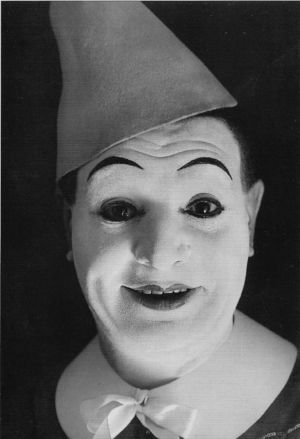 Jean-Marie Cairoli taught his sons, Filip (Louis-Philippe, 1899-1990) and Carletto, all the circus basics, including his own specialties, juggling and music—and also what had finally made him famous, the art of clowning. Filip, the elder, became in time an excellent augusteIn a classic European clown team, the comic, red-nosed character, as opposed to the elegant, whiteface Clown. and a remarkable juggler and musician. As for Carletto, he made his debut in the ring at the tender age of seven, in blackface and dressed as a groom: He brought his parents the instruments they used in their musical act. Ten years later, in 1927, he made his debut as an augusteIn a classic European clown team, the comic, red-nosed character, as opposed to the elegant, whiteface Clown. in the ring of the Cirque Medrano in Paris, with his father and the famous augusteIn a classic European clown team, the comic, red-nosed character, as opposed to the elegant, whiteface Clown. Porto, in the trio Cairoli, Porto et Carletto. It was not an unnoticeable debut: Cairoli, Porto & Carletto replaced the Fratellinis, who had just left Medrano for the Cirque d’Hiver. Nonetheless, Charlie held his own. He was a very good musician and an excellent eccentric dancer, and he had an engaging, happy personality and a good sense of timing. A Parisian critic noted a little later: "As [Carletto] danced, we thought of Grock, 'when he wasn’t Grock yet'. Because Grock, at the time, was perhaps not much different from today’s Carletto." Considering what Grock had become, it was quite a compliment indeed. The shadow of the great Porto loomed large, but season after season, Charlie affirmed his individuality and secured his place in the trio. In 1934, Carletto married Violette Fratellini, the daughter of Paul Fratellini—who, incidentally, had a role similar in the Fratellini trio to that of Carletto in the Cairoli trio: the contrepitre, the character in the middle, between the clown (François) and the principal augusteIn a classic European clown team, the comic, red-nosed character, as opposed to the elegant, whiteface Clown. (Albert). Like all the Fratellini children, Violette had been trained by her uncle François; she had performed a comedy tumbling act with her sisters Regina and Tosca, called The Tomboy Girls. The opportunity to watch the great clowns who shared the bill at the Cirque Medrano during these years was certainly a good part of Carletto’s apprenticeship. The period between the two World Wars marked the golden age of classic European clowning, and Carletto had many occasions to observe such illustrious augustes as Bario Meschi, Rhum (Enrico Spocrani), Emile-Paul Loyal, Grock, Béby (Aristodemo Frediani), the Andreu-Rivels with Polo and Charlie Rivel, and Oreste and Alfredo Rastelli with Aristide "Chocolate" Ferreira. At the end of 1936, after a long and successful association, Porto left the Cairolis to create a new duo with the clown Alex Bugny. Jean-Marie Cairoli revived his trio with the help of his older son, the talented Filip Cairoli, who had worked before with various partners—including Alex Bugny, and the legendary clown who had "made" Grock, Antonet (Umberto Guillaume). In the winter of 1938, the Cairolis went to work in a Christmas pantomimeA circus play, not necessarily mute, with a dramatic story-line (a regular feature in 18th and 19th century circus performances). in Birmingham, England. Clem Butson, the manager of the Tower Circus, the magnificent circus building in the popular Lancashire seaside resort of Blackpool, saw the Cairolis in Birmingham and offered them a contract for his circus’s 1939 summer season. In Blackpool, the first show that featured the Cairolis in the summer of 1939 was, by all accounts, one of the best ever presented in that legendary building, with a stellar cast that included Alfred Court and his mixed group of fifteen leopards, panthers, jaguars, puma, and snow leopard (presented by Damoo Dhotre in matinees); the superb horse acts of Emma Truzzi; and the high wireA tight, heavy metallic cable placed high above the ground, on which wire walkers do crossings and various acrobatic exercises. Not to be confused with a tight wire. act of the Wallendas. The Cairolis’ appearance at the Tower Circus was quite successful; they performed a musical entrée(French) Clown piece with a dramatic structure, generally in the form of a short story or scene., in which Filip did his most memorable trickAny specific exercise in a circus act. : Juggling ukuleles while picking their strings as he throw them back up, thus producing a tune out of them. Then, on September 1, Germany invaded Poland, and in turn, France and England declared war to Germany. Nonetheless, the Cairolis were offered another contract at the Tower Circus for the 1940 season. Years spent at the Cirque Medrano, where they had to change their material every two weeks, made a return engagement in a circus that kept the same program all summer long an easy proposition: The Cairolis actually had enough material to renew their act for several seasons! When Jean-Marie and Carletto returned to Blackpool in the spring of 1940, the "phony war" had ended, and the Germans occupied Paris. Filip, who had been called for active military duty, and ended in the Défense Passive (the Home Front), didn't return. Finally given a pass to travel and work in foreign countries, he chose to go to Portugal and look for a way out of Europe. (Soon after, he sailed for South America, where he would spend the rest of his career.) On the other hand, Carletto’s return to England began on a sour note: In June, after only two weeks at the Tower Circus, he was arrested and deported to the Isle of Man. Since he was born in Italy, he was Italian, and Italy was at war with England. Already sensing that his being born in Italy was not going to be a comfortable situation, however, Carletto had applied the previous year for a French passport, but he had not yet received his new papers. According to what Charlie recalled later, his ordeal turned out to be relatively pleasant: Many of the Italians deported to the Isle of Man had been working as chefs in British restaurants, and he remembered his sojourn there as a long gastronomic party. Nonetheless, when the proof of his French citizenship finally arrived in October, Charlie was happy to return to the main land. He and his father chose to remain in England; they went to work in an ammunition factory, and participated in variety shows for the troops. They also found engagements in music halls, and survived until the beginning of the 1941 summer season at the Tower Circus, where they had been signed anew. Blackpool is located on the west coast of England, on the Irish Sea, and was thus relatively safe from German bombers. This fortunate situation allowed the Tower Circus to carry on its summer shows during the war—and since it was not possible anymore to bring acts from the continent, the Cairolis were very welcome indeed and became a fixture of the Tower Circus. During the winter months, Jean-Marie and Carletto Cairoli worked in Christmas pantomimes and in music hall (vaudeville). In 1943, they appeared as the "Cairoli Brothers" in the movie Happidrome, a visual version of the popular BBC comedy radio show of the same name. 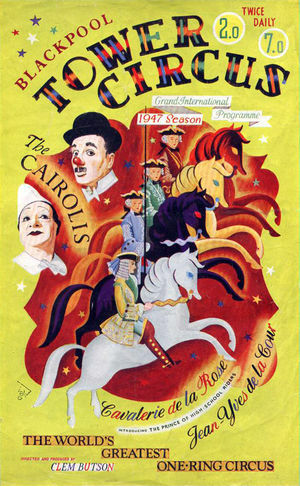 The following two seasons (1944 and 1945), the Cairolis didn’t appear at the Tower Circus, where they were replaced by the well-known clown Coco (Nicholai Polakovs, 1900-1974), a long-time fixture of Bertram Mills Circus, and his sons, Michael and Sascha. This was because Jean-Marie and Carletto had started touring with the popular comedian Tommy Trinder, who had been scheduled to star at the London Palladium (London’s legendary music hall, where the "Cairoli Brothers" had already worked) in a George Black revue titled If It’s Laughter You’re After. On account of the recent events that were turning the tide of the war, the revue was retitled Happy and Glorious; it opened on October 3, 1944 and lasted until April 6, 1946, after a record-breaking 938 performances! The Cairolis returned to Blackpool immediately afterwards, for the 1946 season; for the next forty-three years, Carletto would never miss another summer season at the Tower Circus. The Cairolis were as successful as ever, and indeed, with a London hit and a popular movie under their belt, their name was beginning to sound familiar beyond Lancashire, and it had gained stature in British show business. Yet, in 1947, Jean-Marie Cairoli, who was sixty-eight, decided to put an end to his long career and he retired to his native France. At this point, the loss of his partner and mentor was not a problem for Carletto: When Filip had left the family act, Carletto had taken over the center spot—and it is indeed his own considerable talent that had made the Cairolis so successful in England. 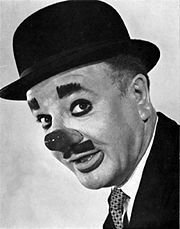 Carletto anglicized his name to Charlie (he also became a British citizen), and it is as Charlie Cairoli that he continued providing laughter at the Tower Circus and elsewhere. He took various partners over the years to play the role left vacant by his father. Paul Freedman stepped in in 1948, and remained eleven years with Charlie. Paul King succeeded Freedman in 1960, playing also a wonderful series of old characters when needed. King died in 1967, and Paul Connor, a younger partner, brought some freshness and modernity to the act at the right time. All of them formed the long succession of Charlie’s Pauls—which allowed him to bill his act Charlie Cairoli and Paul, whoever his partner was. Finally, in 1974, Charlie Junior, Charlie’s son, who had already been participating in the act as an additional augusteIn a classic European clown team, the comic, red-nosed character, as opposed to the elegant, whiteface Clown. since the late sixties, took over and kept the role until his father’s retirement in 1979. Of course, Charlie made good use of that traditional figure of authority in classic clown comedy, the ringmaster(American, English) The name given today to the old position of Equestrian Director, and by extension, to the presenter of the show.. It started with the legendary George Lockhart, who had been for a long time in charge of the ring when the Cairolis came to Blackpool. Then it was Trevor Bale, who replaced Lockhart in 1946, Alfred Delbosq (from 1948 through 1953), Henry Lytton (who came from the theater), and finally—and perhaps more significantly—the very talented Norman Barrett, who began officiating at the Tower Circus in 1966, and remained there until 1990, long after Charlie’s death. Like Charlie Cairoli, Barrett eventually became an iconic figure that everyone associated with the Tower Circus. Off-season, Charlie Cairoli appeared in Christmas pantomimes in Leeds or Bradford, which was always an event eagerly awaited by young audiences. He also did a cameo with Paul Freedman in another movie, The Secret People (1952), starring Valentina Cortese and featuring a young Audrey Hepburn. 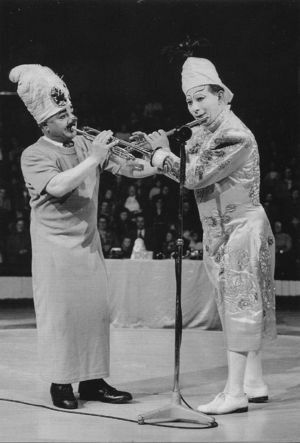 On April 13, 1955, Charlie Cairoli and Paul (Freedman) were part of the first Royal Variety Performance ever given outside London: It was held in the 3,000-seat Opera House Theatre in Blackpool, in the presence of Queen Elizabeth II and the Duke of Edinburgh. Charlie and Paul performed amidst a stellar cast that included The Crazy Gang, Morecambe and Wise, Arthur Askey, George Formby, and Flanagan and Allen, among other princes of British comedy. Although Charlie Cairoli became Britain’s most famous clown and was one of the principal reasons why so many families went to Blackpool in the summer and attended a performance at the Tower Circus, his fame expanded beyond the British Isles. He made television appearances in the U.S (twice on CBS’s The Ed Sullivan Show in 1962, and twice on ABC’s The Hollywood Palace in 1966) and in France (on the long-running French Television’s circus show, La Piste aux Etoiles, in 1973). In 1966, he was invited to participate in the prestigious Gala de La Piste, an annual fund-raiser held at the Cirque d’Hiver in Paris: Carletto was returning to the French capital for the first time since the beginning of WWII, and the Parisian audience feted him as the star he indeed was. For many old circus enthusiasts, the memory of Cairoli, Porto and Carletto had never faded away. Charlie Cairoli & Co. appeared in three other editions of the Gala de La Piste, in 1967, 1972, and 1977. Charlie was also often featured on British television—most notably in the famous documentary show, This is Your Life, in 1970, where Eamonn Andrews retraced the life and career of the great clownGeneric term for all clowns and augustes. '''Specific:''' In Europe, the elegant, whiteface character who plays the role of the straight man to the Auguste in a clown team., who was already a living legend. In December 1977, Charlie participated in the fifth International Circus Festival of Monte Carlo; the large hippodrome tent that hosted the Festival at the time was notorious for its lack of hospitality to clowning, and it was certainly not a good venue for Charlie’s subtle playfulness (which was very real indeed, in spite of his fondness for slapstick humor). He didn’t get a Gold or Silver Clown (no clown did—beside Charlie Rivel in the very first Festival—until George Carl in 1979), but he was awarded the Louis Merlin Trophy, one of the Festival’s major prizes. "Of course," Charlie remarked afterwards, "the Gold Clown passed me by, but we have been quite a few like this; not everybody can win. But the name of Louis Merlin brings back so many good memories that, all things considered, I cannot regret anything." 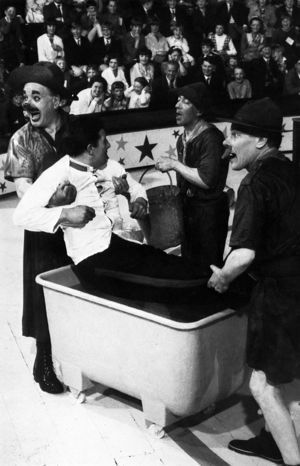 The 1979 season at the Tower Circus was the last for Charlie Cairoli: In June, he had to leave the show and was hospitalized for exhaustion. Finally, in November, he announced his retirement. The Rastellis, whose clown act had been very successful in England, were called to replace him the following season. But of course, Charlie Cairoli was never truly replaced: After forty years, he had become the soul of the Tower Circus—and anyway, few would have been able to match his talent, not to mention his popularity. He died soon after, on February 17, 1980 in his home in Blackpool. 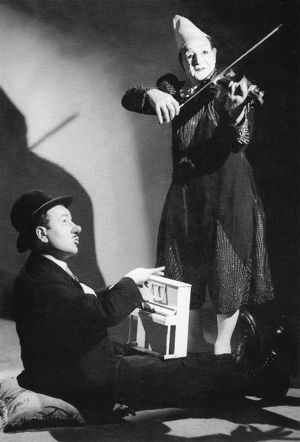 Twenty years after his death, in 2000, World’s Fair, the British entertainment industry's weekly newspaper, awarded Charlie Cairoli a posthumous Life Achievement Award, which was presented to his wife, Violette. Then, in 2002, the Royal Post of the British Overseas Territory of Gibraltar published a postage stamp with the effigy of the great British augusteIn a classic European clown team, the comic, red-nosed character, as opposed to the elegant, whiteface Clown., replete with his trademark makeup and bowler hat. Finally in 2008, a Blackpool councilman, Tony Williams, declared that Charlie Cairoli "brought more visitors to the town than any single entertainer. Charlie has never been recognized for his massive contribution to Blackpool, and we should honour our local heroes." He called for the erection of a statue of Charlie Cairoli. The statue (by sculptor Brian Nicholson) was eventually unveiled by the Mayoress of Blackpool on April 23, 2013, in the Rose Garden of Stanley Park—one of Charlie's favorite destinations.